Beginning with Guru Nanak, a lineage of great prophets appeared in India and became known as the Sikh Gurus. 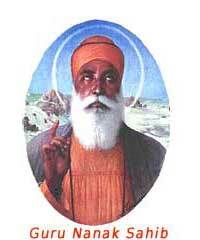 Guru Nanak (1469-1539 C.E.) was of contemplative temperament as a child, little interested in worldly matters. As a young man, he disappeared into a river for three days. When he reappeared, radiant, he proclaimed the universality of God, beyond sectarian divisions. Leaving his family behind and taking a Muslim musician with him, Guru Nanak undertook long journeys to preach the oneness of God and the fruitlessness of empty religious rituals. He engaged many Hindu and Muslim authorities in dialogue, composing hymns about inner versus outer ways of religion. He preached and lived according to a practical path to God: work hard to earn your own living, share with those in need from your earnings, and always remember God as the only Doer, the only Giver. He encouraged people to remember God by continually reciting Nam, the Name of God. Indian society of the time observed many social and religious distinctions between people, but Guru Nanak introduced the ideal of a new social order of equality, justice, and service to all. He sang of the one formless God whose Light is within everyone. Guru Nanak praised God, rather than himself, but many miracles have been attributed to his spiritual power and gurdwaras (Sikh temples) have been built at places where these miracles were said to have occurred.